A continuation of part 1 and part 2. At the end of this post are some phrases from Philippians as Paul expresses his thankfulness to his supporters from that special church. Paul was thankful for the love, friendship, and support of his friends. But he never asks any of them in his letter to go on mission with him. And we feel somewhat the same. We want people to join us, but if everyone were here, who would send us? There is no way we can do it without support through prayer and of course financially. I work here for free for people who cannot pay thanks to the generosity of Christians in the United States who have decided to share some of what they have with us and with the poorest people of Peru. If everyone came it would be impossible to do what we do. Also for our family it is restful to know that there are people who are keeping things stable back home. It gives us peace to know that when we go home, there will be people there we love who are continuing in the good work going on the United States of America. I don’t want everyone to come because I want to know you are there. So I don’t want everyone to come, but I want everyone to know they are welcome to come if that is what God has for them. We are thankful for you. See how Paul rejoices in his friendship with the Philippian church, and please know that we feel much of the same. “It is right for me to feel this way about all of you, since I have you in my heart, for whether I am in chains or defending and confirming the gospel, all of you share in God’s grace with me. God can testify how I long for all of you with the affection of Christ Jesus”. “I hope in the Lord Jesus to send Timothy to you soon, that I also may be cheered when I receive news about you”. “It was good of you to share in my troubles”. “You sent me aid again and again when I was in need. Not that I am looking for a gift, but I am looking for what may be credited to your account . . . They are a fragrant offering, an acceptable sacrifice, pleasing to God”. See the excerpt below from a commentary I am reading for our Philippians bible study. I think this is interesting, maybe more to me than others since it is directly applicable in some ways to our current situation. I also post it in light of the post from yesterday recruiting others to come to Curahuasi. I read the part below about some who raise pastors or missionaries to a higher level as a way to avoid the call to missions. I do not know if this is common or not, but I suspect that if it is, it is perhaps a subconscious effort. I want to say that we are so normal, struggling with our parenting, struggling with reading the Bible consistently, and struggling with prayer, and struggling with selfishness and even laziness at work. Yet we are happy and feel like we are in God’s will, doing something that matters. And I want those who think about it, who think they might want to do missions, to know that they can do it too. And we will be here to help you through the culture shock and adjustment; or perhaps more honestly we will go through it with you. So if you are interested, come on! Missionaries and the “Average” Believer — Two-Tiered Configuration? The two -tiered system of martyrs and “average” believers exists in the American church in a different guise today. Now we place missionaries or pastors above other believers, creating a privileged class that does the church no good. Paul felt compelled to speak the gospel (1 Cor 9: 16); God had called him for this task, and he was only being obedient in carrying out that task — God gives the growth (3: 6). Paul cannot boast in anything, just as the man washing dishes is obeying the call to be a cleaner of the restaurant kitchen, or the woman performing surgery on an infant’s heart is obediently using the gifts of healing given her by God. And the missionary is no more obedient to God’s call than the housewife and stay-at-home mother. I’ve been both — I know. In each case, obedience is the operating factor. That means that missionaries cannot boast that they are doing more for the kingdom or are somehow gifted with a higher calling. Sadly, not all missionaries I have met would agree with me. Moreover, many like to exalt missionaries because as they build them up , they can rationalize that since they are not such strong Christians, God could never call them into mission work. The two-tiered system thus meets both needs — that of the missionary who wants to feel privileged, and that of the “average” believer who does not want God to call them to missions. This God-dishonoring dance needs to stop. It also means that the housewife has as much responsibility to live into God’s kingdom, to step outside her comfort zone and obey God as he asks her to risk for the sake of the gospel. The point is not what we do; the point is that we are doing what God asks us to do. Longman III, Tremper; McKnight, Scot; Cohick, Lynn H. (2013-10-29). Philippians (The Story of God Bible Commentary) (Kindle Locations 1588-1593). Zondervan. Kindle Edition. Tomorrow a final post in this series on why I don’t want nor should everyone come. I have heard somewhere that there are 1000 christian doctors in the world that have committed themselves to long term medical mission work with the poor. I think Texas by itself graduates 500 to 1000 medical doctors every year. That makes me exceptional, but I will tell you I do not feel exceptional. I feel and am very normal. 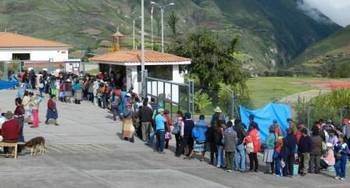 We need more normal people in Curahuasi and everywhere in the world serving the poor through medical missions. And even more interesting is that we are building a school. And we desperately need teachers. Come teach in a country where the education based on standardized testing compared to other countries is last place in every category. You can make a difference no matter how normal you feel you are. So I would like to challenge my medical friends and my friends in education to do something different, hard, and perhaps even exceptional. Count the cost and find that God is worth it. From the Diospi Suyana Hospital website. The queue at the entrance speaks volumes. With our current doctors, between 100 and 150 patients can be treated per day. Many people come from afar, hoping for an examination by a medical specialist. Currently, we have specialists in the field of internal medicine, general medicine, pediatrics, surgery, gynecology & obstetrics, ophthalmology and dentistry. This spectrum is good, but it desperately lacks specialists in the departments of urology, orthopedics and anesthesia. We are looking for committed Christians, who for several years, would be willing to practice their profession at a mission hospital. In Germany, there are about 500,000 doctors, but only an estimated 500 of them could imagine such work. These volunteers need to be found. On the streets of Curahuasi, below the Pan American highway. There is a lot of work still left to be done in preparation for the school year that starts in March! It looks like reinforcements are on the way. Every day as I enter the hospital I see the piles of wood stacked up, and I think “Man, there is still a lot of work to be done!” Here is some more news from the Diospi Suyana Hospital webstite. 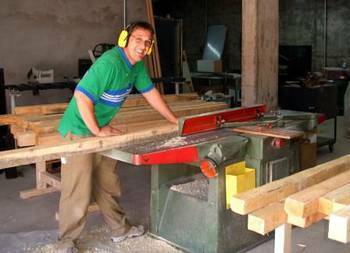 Master carpenter Burkhard Jochum comes to Curahuasi for a month – as a volunteer! Our hospital carpenters are doing their best to produce all those shelves, cupboards, desks and pin boards for Diospi Suyana school. The sheer quantity of furniture to be manufactured, however, is so huge that, disheartened, most journeymen would throw their saws in the corner. Help is marching up, though. From 16 February, master carpenter Burkhard Jochum is going to hammer, saw, file and screw as though his regular breakfast depended on it. Between 2007 and 2008 he already did a fabulous job on the hospital’s interior with, as just one example, 400 doors crafted by him. A personal attribute of his: quarterly workaholic. This is what I see everyday as I walk to the hospital. I tend to enjoy the view more on the way down, while on the way up I just concentrate on every next step as I breath heavily. So for a taste of the walk to work click through the gallery. This is part of the life that God has given us here in Curahuasi. This part is both a trail and a water drainage ditch. Some big dogs behind this sign. Pass the building and you are at the hospital!